Sleep or ELEEP it? That is the question. I’m on the plane home from the US bringing together my thoughts of a sponsored trip that will influence policy and learning. My return from a study tour of Colorado and California provides a firm foundation and inspiration to move forward some key EU policy projects while beefing up my teaching material. And while the ‘business’ side is important, it must be inserted at the start that the personal bonds and connections I developed with my travel companions are equally important. I am a member of Emerging Leaders in Environment and Energy (ELEEP), under the umbrella of the Atlantic Council and the Ecologic Institute . The EU and the Bosch Foundation provide the funding for our group. We interact on an online Facebook platform, where we share information and have in-depth discussions. Despite the ‘Facebook’ label, this is immensely useful method for sharing information. We are also able to go on trips which brings us into contact with policy makers, business people and in general the people who are making it happen. The group is populated by the ‘who’s who of who is not yet who.’ Thus, about 60 tier-two people that inform and influence the tier 1 people. We are the influencers of the influencers. And one day, despite our self-effacing jokes, will be the tier 1 people. Thus the great outcome of the project is investing in future leaders. This trip held the objective of informing us of energy issues, mainly revolving around shale gas and renewables. In fact, you can’t talk about US energy policy without a discussion of the impact of shale gas and the fracking technology. It succeeded on this level. The people that we met with and what we saw really helped us contextualize the debate around the gas. In addition our exposure to the success or failure of different policies could be seen as we drove around Colorado and California this past week. The significant footprint of solar power in Colorado – with 300 days of sun, reflected Colorado’s pursuit of a 33% Renewable Portfolio Standard; while in California our legislative staff roundtable, in the Capital building in Sacramento, proved to be a highlight while the legislative staff discussing the issues around shale gas and net metering in the state. Our meeting with the California Air Resources Board was also great. In my other life before a career, marriage and fatherhood I had a penchant for traveling to distant and odd places in the Middle East, Russia and Europe (I include Budapest on that list). My purpose was always to give me a better sense of what was going on in these places. No doubt those experiences still play a role in my analysis of events in these locations. In a similar vain – and with similar results, this trip, brought me into direct contact with the people that are at the forefront of progressive energy policies and businesses. They are the ones leading the charge on what our global economy will be based on after the current shake-out stops. It is clear to me that the value of investing in the ELEEP program will result in more transatlantic awareness and real influence on policy and business. There are many common issues that are being grappled with on both sides of the Atlantic. Understanding the contextualized nature of certain programs or technologies instills a robust knowledge that can be applied in each of the ELEEP member’s areas. All this knowledge is not without a price. Sleep is what we paid. Our packed days and travel itinerary meant squeezing the most out of every hour. One week felt like three weeks. Sleep was squeezed but the results were worth it. Overall, the trip exceeded my expectation. I will be following up with some of the people I met to help inform my work on shale gas policies and regulations in Europe. Also, the courses I teach on sustainability in business and energy will be enhanced using the material I came across on the trip. I’m now indebted to the program and the people I met in ELEEP and in each state. Both my professional and personal life are richer for this travel experience. But time now for a little shut eye before the plane lands – then the action to implement change begins. I sometimes wonder if those top people that fly in and fly out for conferences ever actually remember what they say. The top CEO’s and politicians for events must give the same speech 20 times before they begin to alter it. Well, while I don’t discount this practice, I was struck by Ferdinando Beccali-Falco, the President and CEO of GE Europe and North Asia. This time I heard him at the 21st Economic Forum in Krynica Zdroj, Poland on September 9, 2011. Mr. Beccali-Falco was also at the Energy Forum that took place in 2008 in Budapest. The main topic was about regional energy markets. There I remember him, and others, made a good case for the need to increase regional coordination in the energy sector. Although not much has happened since. This year, he even referred to his previous speech in the region and the need to increase economies of scale. He laminated on the lack of progress since then. He places this down to the lack of political will along with not enough vision and understanding that a new energy system can bring. For him, we are hitting the roadblock for implementing policies, with politicians and bureaucracy central in this roadblock. 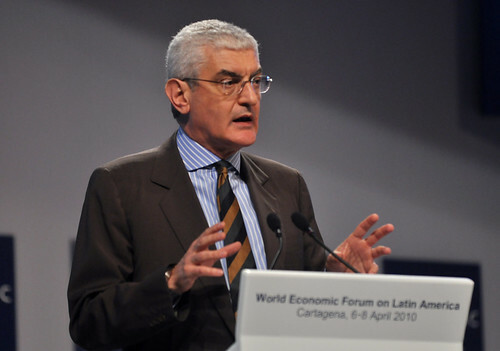 The speakers at the Economic Forum – generally – could be divided into two groups. The first group had the vision and knowledge that a more integrated, low carbon, and smart energy system can provide – at around the same cost as the current system. The second group, were grappling with old arguments of price and uncertainty that an integrated energy system with high levels of renewable energy sources brings. Thus the second group views gas as an essential element to bridge to a low carbon energy system. Although this is a false view, as enough technologies exist to begin to strongly re-invent the energy system. My contribution to the conference was in the form as a commentator to the panel discussion on ‘After Fukushima: Europe’s future energy mix.’ Lacking on the panel was someone that represented the renewable energy sector, and while they were present in other sessions, I focused my comments on the strong need to reduce energy use, increase RES and quickly begin the transition to a post-carbon energy system. According to the European Climate Foundation, to make the transition happen within a moderate investment climate, it must begin within the next five years. The inability of governments, regulators and energy companies to cooperate in the CEE region, fails to provide the foundation for this long – but fruitful – transition. (see my earlier post on the necessary cooperation). Overall, the conference was informative and inspiring. There is widespread agreement, at least in the energy industry, that the smart grid and demand reduction are essential for the future energy system. Both Schneider Electric and Alstrom had strong speakers describing the benefits that a smart grid bring. The political tension that previously marked energy conferences, has given way to more practical and technical issues. However, it can expected that this aspect will emerge again. One of the essential elements of a smart grid is complete market transparency in the electricity system. For those like, Mr. Beccali-Falco who are calling for regional integration and rolling-out new technologies at a large scale, it is distrust and vested interests into nationally controlled energy markets, which remain as the primary barriers for the emergence of the smart energy system of today. The difficult transition to a low carbon energy sector is strikingly apparent when looking at the Polish market. However, as the participants at the 5th Energy Forum, held this year in Sopot, Poland, displayed – some market actors are more willing to make this transition than others. The reason that I mention Poland as a challenging place to make this transition is the country’s almost total reliance on coal. Over 90%. The advantage of traveling to another country for a conference is that you can learn a lot about that country’s energy sector. And not just by the statistics, but by talking to the different officials from government agencies and companies. What I took away, whether correct or not, is a strong resistance from established companies and some government institutions about the purpose of moving towards a low carbon economy. In a way, for Poland, under the present energy mix, reductions may seem pointless. That is moving from 94% dependency to 60%, is like switching from a vodka martini to vodka and orange juice. Are you really going to feel the difference in the morning? I would argue yes, the short term health benefits from the additional orange juice, can lead to further reduction in alcohol over the long term. If you don’t start at some point, then you’ll never make it. On another note, the organizers of the conference were not only kind enough to invite me but also to have me moderate the session on the Modernization of the Energy Sector in Central Europe. They arranged a great, and diverse panel, which proved really successful in assessing some of the key aspects of the market developments in the CEE region and how some of these aspects can be applied to the Ukraine and Russia. Interestingly for me, Mr. Khotey from the State Property Fund of the Ukraine outlined how the country was preparing to privatize some of its energy companies, and notably distribution companies. I previously did on a study on this topic for USAID examining the efforts in Bulgaria, Romania and Macedonia. It was also mentioned by one of the speakers that role of the energy regulator was to ensure the interest of the consumer, which for him, is connected to low prices. On this point, I would also have to take issue, as not only is it in the interest of the consumers to pay a fair price, but also ensure that the energy system is transformed over the long term. While there are different regulatory philosophies, ensuring that consumers benefit from low(er) carbon energy sources is essential. Energy prices and coal are interlinked for Poland. There is no doubt that renewable energy when priced against coal, with no carbon pricing, is more expensive. However, if CCS technology is priced in with the cost of coal, then the opposite is true – coal becomes more expensive than renewable energy. So if Poland is waiting for CCS technology, in order to ensure the place of coal in the country’s generation mix, and to maintain cheap generation, the consumers will be footing an even higher bill in the future. Therefore, as distasteful as it is in the short term, switching to vodka and orange juice, will not only improve your health, but save you money as well. The energy and consumer resources of the SCEE region are now in play for global players. Traditionally dominated by European utilities which pushed into the region when countries began to privatize their electricity and gas distribution companies, the likes of E.ON, RWE, EDF etc… now a second wave of investment may be occurring. It may be too soon to be calling it a full wave, but there is no doubt that constrained home markets and past expansion plans by a range of energy companies have hit a wall with the global economic meltdown resulting in new strategies being deployed. Just as the first wave of privatizations altered the energy landscape in the SEE and CEE regions, the second wave represents strategic actions that will cement companies into the region for decades. First let’s run through the slew of stories that serve as the foundation of this proposed second wave, it looks like a grab from Cold War foes. Today there is the setting up of the joint venture between Gazprom and the Hungarian Development Bank (MFB) called ‘éli Áramlat Magyarország’. It is the company that is meant to operate the South Stream Pipeline through Hungary. However a decision will be made in 2011. Although you would think that MOL would actually be involved in operating a pipeline through Hungary, it is already committed to South Stream. The Russians are still in the headlines in the noisy affair in Croatia of whether they are or are not interested in taking over INA. They continue to deny it, and MOL continues to come under political pressure for ‘corruption’ allegations over how MOL gained control of the company from the Croatian state. Nonetheless, less file this under ‘interested FDI’. As it could be seen with the previous story that if South Stream doesn’t pass through Hungary then it would pass through Croatia, thus having to deal with the technical competence of INA-MOL. Either way, MOL and Hungary stay in the South Stream story – thus the current sour grapes between MOL and Russian Surgutneftegas may go by the wayside before 2011, when actual construction decisions on South Stream (and Nabucco – with US support) are made. But waiting to put both these pipe dream pipeline plans into disarray is Exxon Mobil, with the aid of MOL, which continue to explore the Mako gas field in Hungary. With Mako possibly holding huge potential reserves – if it can be extracted. Two earlier tests wells have failed which may have helped to prompt Exxon Mobil to buy Texas-based XTO which has expertise in shale and tight-sands deposits. Very useful expertise for the Hungarian tight-sands, and other countries’ deposits in the CEE region. This should mean if gas is extractable, XTO will be able to bring the technical expertise to make it happen. Lest we forget that we are at the beginning of a green revolution, US based Fagen Inc will be setting up a bioethanol plant in Hungary. With Hungary a top 10 global exporter of corn and wheat. Hungary may be well positioned to use its natural resources to its advantage. And this is the true story of the second wave of foreign investment into the region. This partial list of FDI, coming out within the same week, does indicate change in how foreign companies are participating in the local energy markets. There is much more activity on the production and resource provision side then on the consumer-services side of the business chain. This represents a maturing of the business market in the region. The privatization of distribution companies was ripe for the injection of private capital which governments lacked at the time and for managerial expertise. The newest round is focused more on investments of energy resources that feed into the consumer side of the business. The result will be a new supply sources that will compliment existing sources. From a security of supply view, diversification of sources is a good thing. But part of any evaluation of security of supply are political and geopolitical elements. The competing/complimantary projects (depending who you talk to) of Nabucco and South Stream no doubt must be assessed from a geopolitical point of view. But I think that is for another posting. What is important is that the investments by these companies represent a long-term regional investment. The necessary skill sets will be fostered with local talent and infrastructure improved. This is a good start to what will become a larger wave of investments set to transform the infrastructure for energy production to low and zero carbon energy sources. Gas and ethanol are key in the near and mid-term transition process. Expertise and the development of infrastructure in these businesses will lead the transformation necessary to reduce the regional carbon footprint. I fail to see how the continuation of inefficient and wasteful methods of energy production serve either companies or society. There is now a downplaying of the expectations that Copenhagen can bring. There is discussion that agreements can be reach later next year, that the timing is not right. We have enough facts and knowledge of the bargaining positions of the different countries… will delay really result in a better agreement? Failure to come to agreement now will only cause more damage both to the environment and to companies needing to know what direction to move in. An uncertain business environment will be plagued by uncertainty on how to deal with the natural environment. Those businesses that are not prepared to make the transitions will be the ones that stand to benefit from failure. These business like, oil companies that are not sufficiently diversifying, will gain in the short term. However, the current financial crisis shows what short term-ism brings for businesses and society. The creation of a binding and clear agreement will provide the necessary structure for businesses to begin ramp up their investments into greater efficiency and sustainable business models.